So at this point, you're wondering what life will be like if you do decide to become a driver. The path most new drivers will take will be to attend a truck driving school, get hired by a company, go on the road for a few weeks with a trainer, get your own truck and then you're off! So let's start at the beginning with the schooling. This is my story. I was 21 years old and working at a warehouse outside of Atlanta, GA. I'm originally from Buffalo, NY where I now reside 14 years later. But when we were 19, a couple of buddies of mine and I jumped in an old van and drove from Buffalo, NY to Atlanta, GA on a wing and a prayer. We were all about the adventure. Actually, I was all about the adventure and LOVED dragging others into my adventures with me, so off we went! After a couple of really fun years my one buddy and I found ourselves working for $5.50 an hour in a warehouse. We worked a ton of hours and enjoyed it. The people we worked with were great and we partied a lot! We damn sure weren't getting rich, but we were getting by. One day we got to work and saw a large six wheel rental truck sitting in the parking lot. I asked the boss what was up. He said we had some pallets we had to run into downtown Atlanta (about 10 or 15 miles maybe) and pick up some others and bring em back. Well, I had never even seen the inside of one of those trucks, let alone drive one. I knew they were automatics and figured I could drive it easy enough. I eagerly volunteered for the task. My boss asked with a skeptical look, “have you ever driven a truck like that before?” and like any responsible adult looking for an opportunity to try something new I lied my brains out!!!!! I said' “Oh yeah! My aunt moved twice and my grandma moved once and all three times we needed a truck that size and I drove it.” He continued with that skeptical look and said he'd talk to the other boss and let me know. Well, I had never even seen the inside of one of those trucks, let alone drive one. I knew they were automatics and figured I could drive it easy enough. I eagerly volunteered for the task. I bugged him repeatedly for the next hour or two and to my absolute delight they said I could do it! I was freakin! This was gonna be a blast! At least I had hoped so. Hell, I had never done it before but what the hell... it'll be fun I'm sure! So we loaded up the truck and off I went. It handled like a big pickup truck. Nothing to it. So I cruised down into the city, found my destination, and made the delivery. Well, before they could reload me it was their lunchtime. So I wandered the city for about 45 minutes, came back, they reloaded me, and off I went back to the warehouse. By the time I got back there it was almost time to go home for the day. I laughed about it and told my buddy, “Wow, I really got away with one. I didn't even have to do any work today. All I had to do was drive!”, and IMMEDIATELY the light turned on in my head. What about becoming a truck driver???? In fact we were so happy when we were told we'd be making $5.50 an hour that we did a ridiculous dance the moment the boss left.... a dance that came to be know from then on as the 550 dance!). So I immediately called a private trucking school and made an appointment. My ma said she would pay for the schooling for me (I gave her a combination of a good sales pitch and guilt) and within a month I was in school... the start of my odyssey. I didn't even have to do any work today. All I had to do was drive!”, and IMMEDIATELY the light turned on in my head. 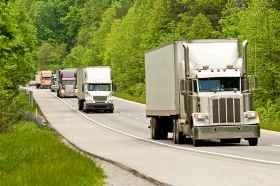 What about becoming a truck driver???? Now why did I pick a private school? Well, that was kinda lucky really. There are private schools and then there are trucking companies that have their own schools. I didn't even know that there were trucking companies that had their own schools! So I found a private one in the area and looked into their reputation. They seemed to be the best around...and they were. So I did enough research to pick a good private school, but you may want to attend school at a trucking company. Let's briefly cover the two types to give you an idea of your options.